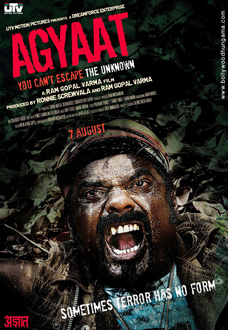 Review Summary: AGYAAT has an absorbing second half but the culmination to the film would meet with diverse reactions. The smart title of the film is the only thing going for it. AGYAAT has an absorbing second half but the culmination to the film would meet with diverse reactions. A film crew lands up in a dense jungle for a shoot. Trouble erupts as an unknown predator begins to kill them one by one. Is there any way the hero and heroine can escape this blood fest? Watch it only when Agyaat-2 releases. Otherwise this mere half baked and tasteless stuff claims your senseless effort!!!! Agyaat is a dud if anything it can only be watched for Priyanka Kothari's skimpy outfits. A spooky adventure set in a dense jungle is an interesting premise. And when you have someone like Ram Gopal Varma at the helm, you go in expecting a paisa-vasool thriller. As for Agyaat, the scariest part of the film is the last frame which lets you know that a sequel is on the way! Please spare us RGV.